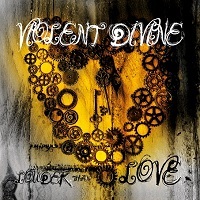 Hailing from Sweden, Hard Rock quartet VIOLENT DIVINE formed in 2005. After their third self-produced album “Release the Hounds,” the band when through some line-up changes. They now present their fourth release, titled “Louder Than Love,” which contains twelve tracks. Let’s get to some of the highlights here. “Apocalyptic and Insane” opens with dirty and fuzzy guitars and a thick thwack of bass. A mid-tempo track with a bit of a swinging rhythm, the vocal harmonies augment the sound nicely. “Crawl” moves much quicker and with some more intensity. This is riff driven Hard Rock, folks. They are not re-inventing the wheel, but it’s an honest and energetic sound. “Faith” is about how you might expect it to sound; a tender little track, with acoustic guitars and pensive, introspective vocals. Mike’s range is solid—he sounds good in both the lower and upper ranges, and it allows the band some versatility in songwriting. In the upper ranges, he has a thick snarl. In keeping with the song titles, “Frantic” is just that; a rattlesnake that covers ground faster than you would expect and with a dangerous bite. The harmonic vocals in the chorus in a lower range remind me a bit of Ville Valo. “In your Bedroom” could go one of many ways LOL. In this case, it is a slower song with some degree of melancholy, lamenting what was. The title track, “Louder than Love,” is a heavier affair, but with thoughtful verses and a big chorus. Sometimes a band translates better live than in the studio, and vice-versa. I think the nature of this track for example would be very impactful live, with driving guitars and extended vocals. “Poison that I am” has a low bottom end from a drop-tuned fuzzy guitar riff and a sing along chorus, while “Right you are” is a quicker track that features some hasty guitar work and dropping the bomb on you in the chorus. “Unbeliever” closes the album. The guitar riff struts in with a bossy demeanor, and the vocals build some nice harmonies over top of the riff. Overall I found the album to be pretty standard when it comes to the genre. Since it’s a sound that has been around for a while, they need to find a way to distinguish their work from others in the genre or it will never quite get off the ground. I think that it is the case here. There is little dynamism, and the riffs are ones we have heard before. The good part is that the songs are easy to assimilate, and the production is strong and clear.